Keith's Odyssey to Planet Fitness: Whip the wine hard! That's what the instructions say! Here's what the white looked like before getting started. You can see the layer of yeast down on the bottom. Left to itself it would all settle out, but it would take a very long time, and probably go off in the meantime. So a couple things. One is to get rid of the dissolved C02. 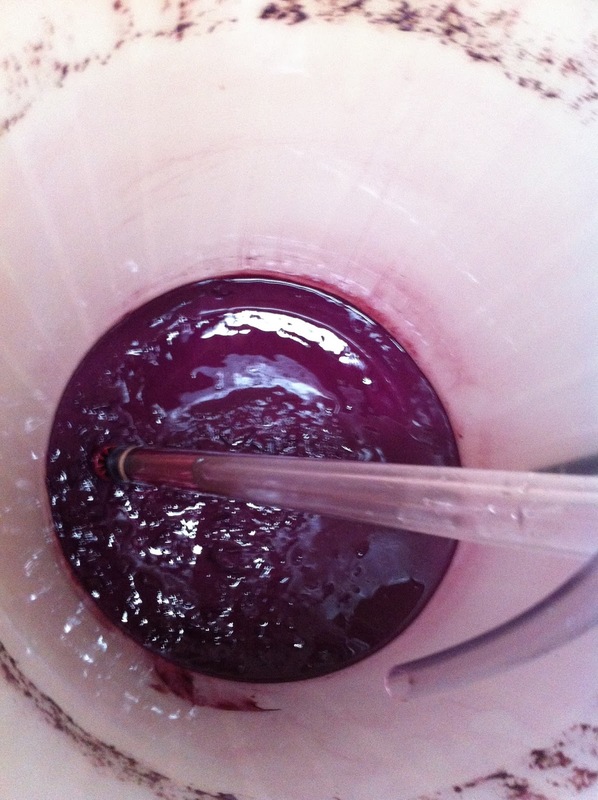 Normally power tools and wine don't go together, but stirring is the best way to degas wine. 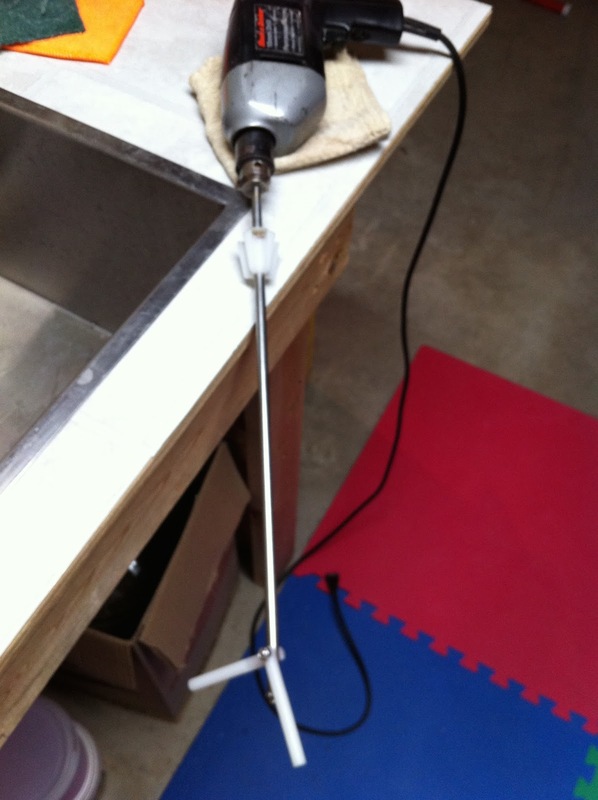 What is stirring but making things go around and mixing it up, and what is a drill but a tool for doing that? Voila. 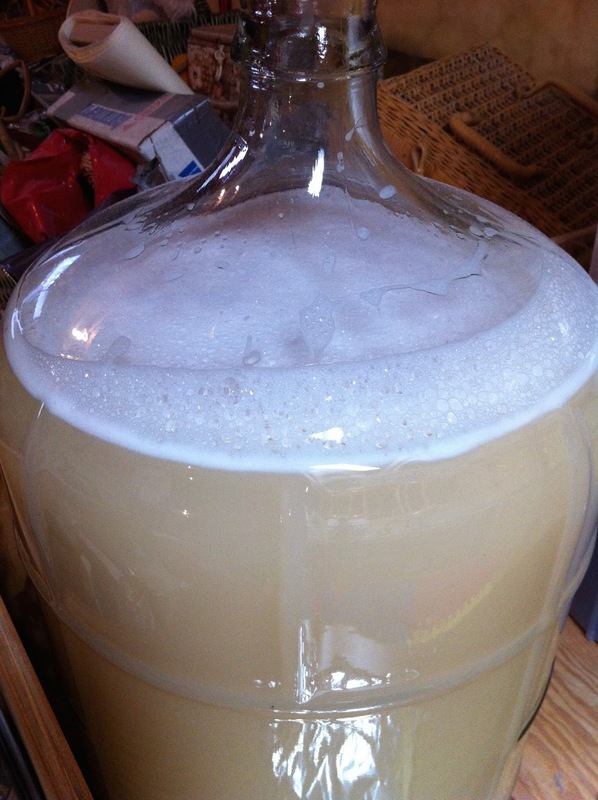 There are a few ingredients added to kill the yeast, and help clump the wine together so it settles faster. 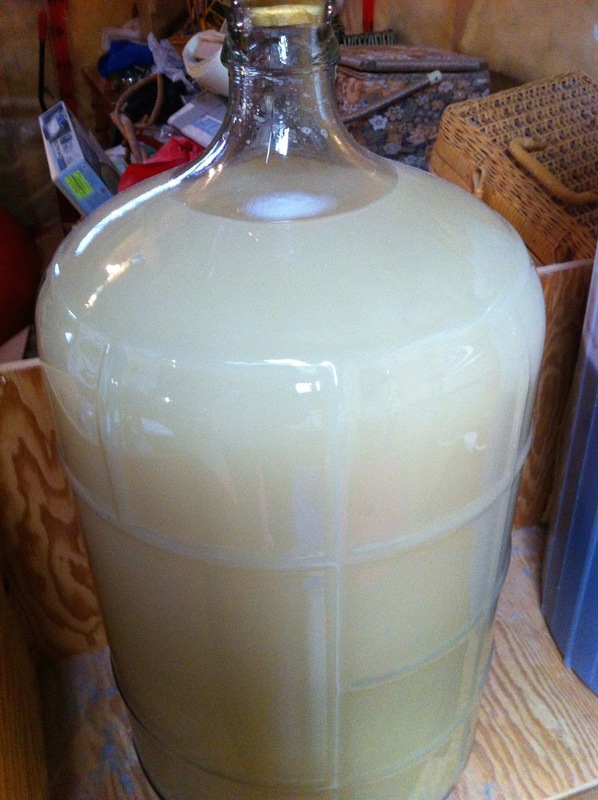 For the white, the instructions say to stir the sediment back in, though often you rack it to another carboy and leave the sediment. This makes sense when you think about it. Whites often take longer to clear, and leaving the sediment in gives the finer particles something to clump to. Note the froth on top, that's the gas leaving. It looks almost like milk at this point. Here's the tool in action. After a while you can already see that it's starting to settle out. Then it was on to the red. This is the sediment that's left at the bottom of the primary. It's essentially bright purple sludge. It produces interesting swirls and patterns when poured out into a sink. Note when you do this for yourself, that this will stain anything that it touches. Forever. Here's the milky white and the red together just after I finished with the red. You can see the faint layer at the bottom as the yeast starts to settle. 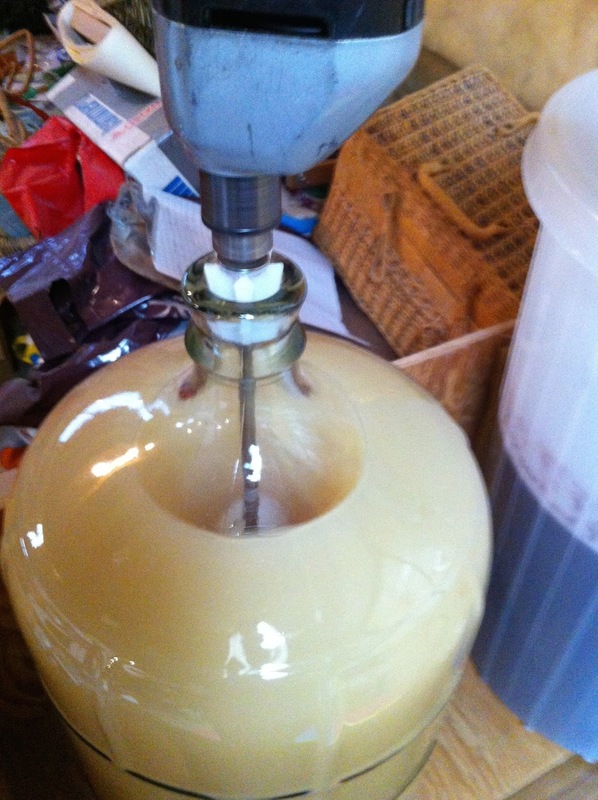 Here's a better look at the yeast settling out of the red. 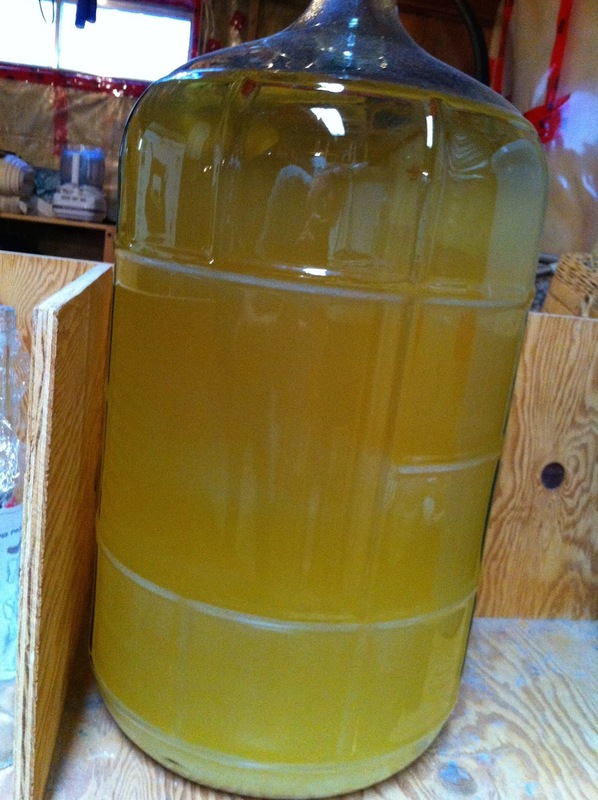 One more of the bottom of both carboys several hours later. Another month and I'll be able to bottle these two, and start another pair of kits. After all that I warmed up and tried a run. It's so nice outside since the first time in a very long time. Shorts and a tech shirt! However, my knee and quad were dubious about the whole thing. I promised them I'd bail out if they complained. There were minor complaints the whole time, but at 3 K I decided they were serious and walked it back. Stretched. Hot shower. Some rolling, more later, like as soon as I finish the blog. After the shower I was nibbling lunch, fighting off the cat snore-ons. I would imagine that not many of you remember Captain Scarlet and Mysterons from the late 60's. A pair of zeros would float over the screen and "The voice of the Mysterons" would intone, and people would fall asleep. Cat snore-ons work exactly like that, except there is no zeros, and no voices, just purrs and wheezy cat snores. I was out for a couple hours. It was very nice. Let's see, a bit of catchup. Swam on Friday; it felt pretty good. I managed to have coffee with Michelle after work, meaning about lunch time. I had left my pack at my accountant's office, and that office is right across the road from where Michelle works. So that was all good, aside from minor worries about dementia. But there are other examples, fortunately in other people. Like the person that parked their truck at Talisman on Friday. They were one of the first people there, and my goodness did they ever do a crappy job of parking! Then the parking lot in front of the British Chippy was almost as bad. You'd think when drivers could see the parking lot lines, they would park better, but no. Often it seems that winter parking is done better. People spread out a bit more. The parking is a bit free form, and maybe it's not quite as efficient in terms of absolute numbers of cars in the lot, but how often are the parking lots that full? Maybe we should just remove the lines altogether? I shouldn't have been surprised on Friday, but my geezer alert was going off. Big time. Dinner at the British Chippy. The entire shop was filled with elderly people, with a couple of exceptions. We were in line, waiting for a table, doing the table counting thing. You know, you've done it too, wondering how long it will be. One elderly couple was just about done, as in plates going crusty, and cups empty. Another elderly couple walked in, waved, sat down with them. Ordered, having successfully jumped the line. The elderly couple at the front of the line were shooting them some major dirty looks. They all chatted. We had a bit of a wait for our meal, in spite of the very considerate advance order done by the nice staff. We ate, not rushing, but not dawdling either. There was a constant line waiting for tables. The first couple had another coffee. Then their guests finished eating, and there was another round of coffee. They were still going at it when we left. I get that they wanted to chat, and a restaurant is a nice time. But holy cow, they probably cost the restaurant $200 in lost turnover. The time to chat is during off hours. During the rush, have some consideration for the staff and the other prospective diners. Tomorrow is supposed to be a nice day, and if my knee doesn't complain too much, I might try to run again. Maybe. 5 K would be nice. I had hoped that for this marathon I'd be able to build up to running nearly the full marathon distance, then tapering, then doing the race. Well, race day is less than two months away now. There is no way I'm going to be able to build to any reasonable volume. I'm pretty certain that even running a half marathon before race day is going to be a bit of an achievement. I've just been looking through the registration site. Non-refundable, non-transferable. Oh well. Perfect! Why didn't I see that before? Another $10 saves the $90 from being a wipe out. Now, 21.1 K, or 10 K. Hmmmmm. Decisions, decisions. Yes, I totally spoiled the little flower the barista made by stirring it with the 'stache before I even got to the table. 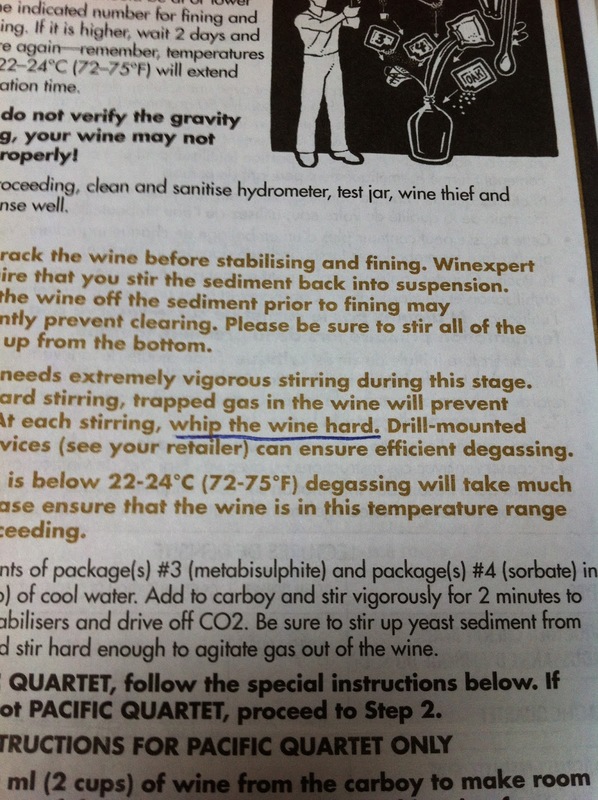 Haha we use a drill when making wine too! The only time I use power tools! I've definitely been enjoying some of our homemade wine these days. Missed it! I've been one of those people who sits in a busy restaurant for hours, usually catching up with a friend! Oops!